Ita Faji building collapsed on March 12. 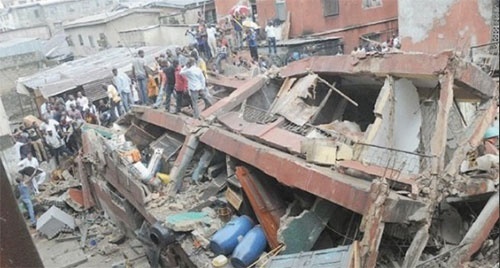 The Socio-Economic Rights and Accountability Project (SERAP) has asked the Lagos and Oyo States government to immediately work out compensation for victims of the collapsed buildings in the states. The victims of building collapse in Lagos Island area of Lagos State and Ibadan in Oyo State have got themselves a group fighting for their compensation. Rights group, the Socio-Economic Rights and Accountability Project (SERAP), is making the demand on their behalf. It wants the “the governments of Lagos and Oyo states to “take immediate action to address the numerous ongoing human rights impacts of the deadly and catastrophic building collapse in their respective states, including by taking meaningful steps to avoid further damage to the human rights of the people affected". A statement by the organisation said: “The Lagos State governor, Akinwumi Ambode and Oyo State governor, Abiola Ajimobi should ensure as a matter of priority, access of victims and their families to effective remedies in a transparent manner, specifically, access to justice, adequate compensation, reparation, and guarantees that incidents like these can never happen again. “These tragedies point to weak enforcement of building regulations and oversight by the two states and urgent need for effective action and reforms. "SERAP is concerned that the responses so far by the governments of Lagos and Oyo states have been insufficient to deal with the massive extent of the human costs of the incidents". In the statement issued on Sunday, SERAP deputy director Kolawole Oluwadare said: “These incidents come as a tragic reminder of the mismanagement, weakness in the regulatory and monitoring regime. "The governments should have done more to prevent them from happening. The group also highlighted that “schools should be a sanctuary - a place where children can learn, develop and play with their classmates, and prepare for their future lives in society. "Collapse of school building due to weak enforcement regulations or corruption is an implicit attack on the right of Nigerian children to education, life, and human dignity. Such situation creates an environment of fear and severely diminishes the quality of children’s education. “The tragedies demand accountability and both Lagos and Oyo states should accept responsibility for these incidents; promptly, thoroughly and impartially investigate exactly how they happened, and publicly apologise to the victims, their families and Nigerians".